On Thursday 12 July, 29 members and friends enjoyed a most interesting and well planned excursion. 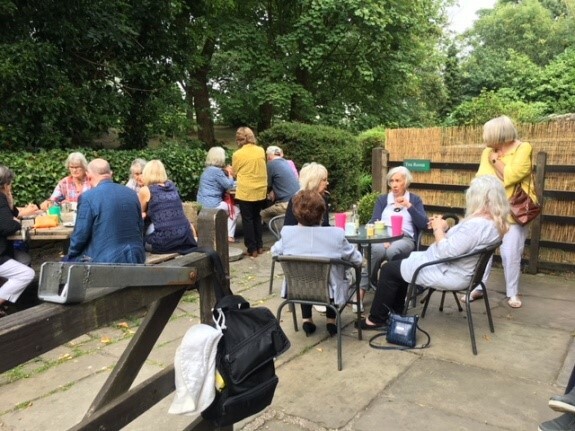 On arrival at Smithills Hall, which is set in 2000 acres of land on the edge of the West Pennine Moors, we had refreshments in the Poppins Tearooms before commencing our tour. 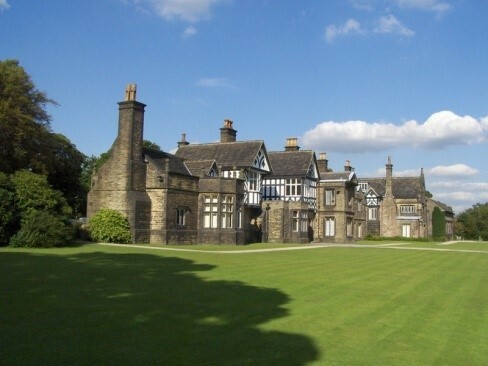 Smithills Hall is one of the oldest and best preserved manor houses in the North West. Its oldest part dates from the 14th Century and originally had a moat. 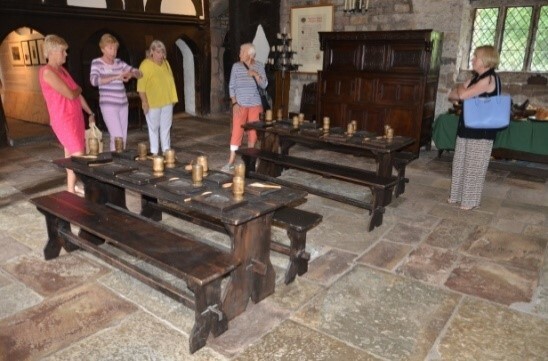 Over the years the Medieval Hall has been added to and our volunteer guide vividly described the building and the people who had inhabited it over the centuries. Beside the Medieval Hall we saw Tudor and Victorian wings and the beautiful private Chapel. There was so much to absorb and many boards to read when time allowed. We were all fascinated to hear the story of George Marsh who gave up his farm in order to become a Protestant priest. However, Roman Catholicism was the religion of the day as espoused by the Tudor Queen Mary. The priest was questioned at the Hall and legend says he stamped his foot on leaving, refusing to give up his faith. That print, now under a protective glass, may be seen today. Marsh was burned at the stake outside Chester in 1555. One of the owners, Richard Henry Ainsworth, ran a successful bleaching business and we heard about the staff who worked for him and their duties and responsibilities. Smithills Hall was the first building in Bolton to have a gas and electricity supply installed, after which less staff were needed. One visit was not enough to see all there was to see and several members said they would certainly return. We then had a delicious lunch at The King William Inn before travelling the short distance to Turton Tower. This is a Grade 1 listed building, the oldest part of which is the stone pele tower. 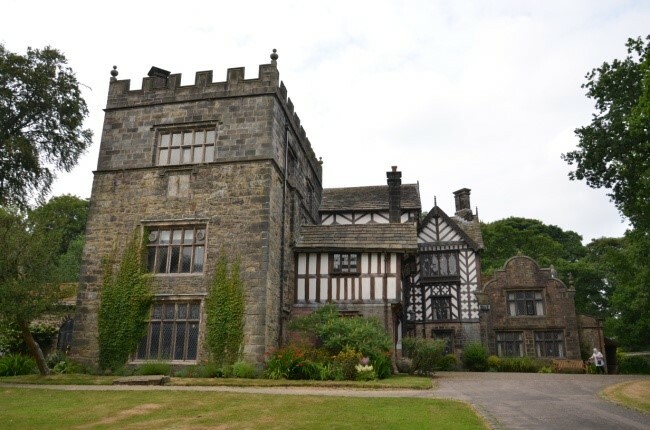 Originally built about 1200 and rebuilt in 1420 by the Orrell family it was then two storeys high and was intended to show off the family’s status. 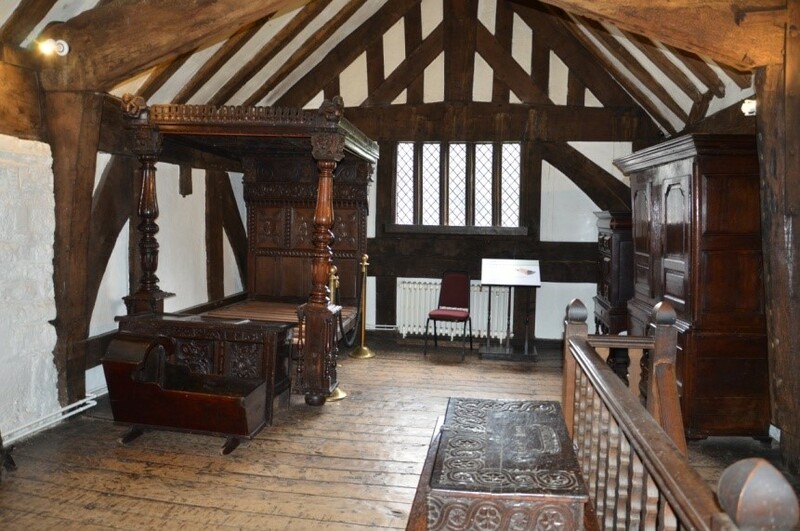 By the 1550s two wooden “cruck frame” wings were built and more extensions added in the early 1660s. In 1628 the Orrells sold Turton Tower to Humphrey Chetham, the Manchester merchant responsible for the creation of Chetham’s Library and School of Music. They made small alterations in the 1700s but it was the arrival of the Victorian Kay family in 1835 which heralded the next major phase of development. Following various owners The Tower was presented to Turton District Council in 1930 and then was taken over by Blackburn with Darwen Council. We had an excellent guide, so eloquent that we were amazed at the end of our tour to learn it was the very first time she had escorted people round the Tower. With the aid of a model of the building she explained how the Tower had developed. We saw the haunted bedroom and heard how she herself had witnessed the fear of a child who would not enter. She explained in a lively fashion how the phrase bed and board came about. It is little stories like this that bring a place to life. At the end of the tour we sat in the gardens of The Victorian Tea Rooms to enjoy the sunshine before departing for home. We thank Chris Cockburn for once again planning such a great day out.